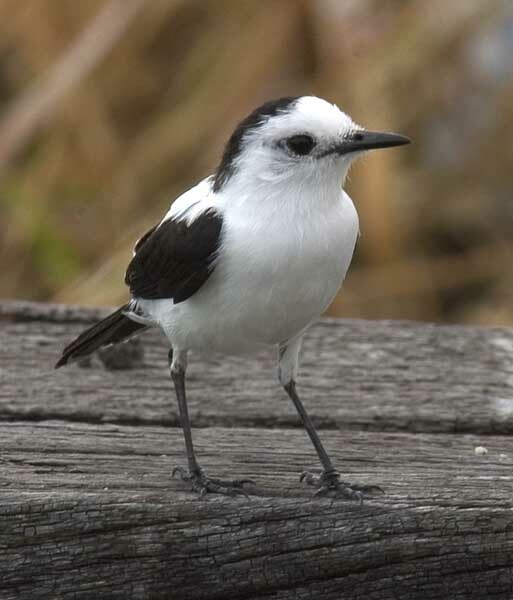 The pied water tyrant (Fluvicola pica) is a small passerine bird in the tyrant flycatcher family. It breeds in tropical South America from Panama and Trinidad south to Bolivia and Argentina. This species is found in marshy savannahs and the edges of mangrove swamps. The nest is a feather-lined oval ball of grasses and other plant material, with a side entrance. It is placed at the end of a branch near or over water. Both sexes incubate the typical clutch of two or three creamy-white eggs, which are marked with a few brown spots. Cowbirds sometimes parasitise the nest. The pied water tyrant is 13.5 cm long and weighs 13g. Adults are mainly white with a black nape, back, wings and tail. Sexes are similar, although the female may have some brown mixed with the black, and immature birds are brown where the adult is black. The call is a nasal djweeooo. Pied water tyrants often bob up and down when perched, and have a fluttering “butterfly” display flight. They forage for insects, their staple diet, in low waterside vegetation. ^ BirdLife International (2012). "Fluvicola pica". IUCN Red List of Threatened Species. Version 2013.2. International Union for Conservation of Nature. Retrieved 26 November 2013. Photo-High Res; Article geometer.org–"Trinidad and Tobago"
This page was last edited on 7 May 2018, at 20:03 (UTC).